Mehrangarh fort is the #1 destination for anyone visiting Rajasthan, India, and for good reason. It has a very rich history, fascinating architecture and amazing views. Hiking and zip lining in Mehrangarh, Jodhpur Fort is a special treat. Jodhpur derives it name from king ‘Jodha’. The suffix ‘pur’ indicates that the city was founded by a Hindu king. It is located in the Marwad region, ruled by the Rathore clan for centuries. In 15th century there was a big revolution that changed everything across Asia and Europe. Jodhpur was no exception. The epic pivotal moment was the invention of gun powder! It quickly became the weapon of choice for the powerful seeking to expand their kingdoms. Thereafter, it was no longer possible to protect kingdoms with arrows, swords and the like. Kingdoms and particularly their capitals needed thick walled forts. Like kingdoms everywhere else, Jodhpur had to build the fort where the administration, royal family and important people lived. Thus the fort’s construction started in 1459. Just has castles and forts came in vogue, they quickly went out of style with the advent of aviation, Air Force and modern warfare. Mehrangarh, which was home to the royal family until 1880, was no longer needed so the family moved to more modern and western palaces in Jodhpur. The fort is now managed by the Mehrangarh Museum Trust, founded and led by H. H. Maharaja Gaj Singhji, the current beloved, honorary king of Jodhpur. 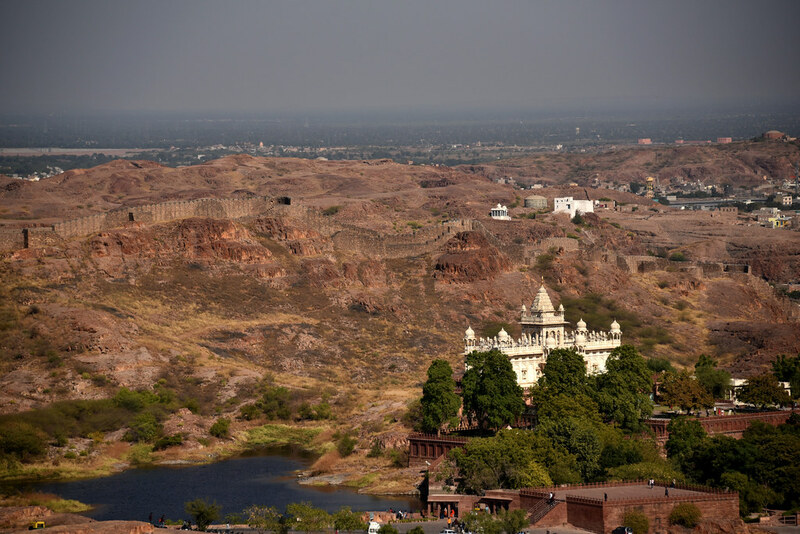 During our visit, we drove up the hill overlooking Jodhpur to reach the fort’s entrance. One could presumably hike up from the Blue city. The main entrance welcomes its visitors with large paintings of Shiva’s wedding. The painting on the right shows the groom’s wedding procession and left shows the bride’s procession. From the main entrance, there is a climb of about 7-8 floors up to the main level of the fort. We took the convenient elevator that was installed in 1995. (To our defense we had family members from 5 to 75 years old, and it was better to keep the group together). From the main level the fort has another five floors. A few of the sections are open for viewing or they showcase art galleries. I’ll talk about a few of them here but really one has to visit the fort to get a sense of the architectural evolution and the rich history of the Menranghad fort. The view from the fort to the city is one of a kind. The fort overlooks rocky mountains and valleys all around. 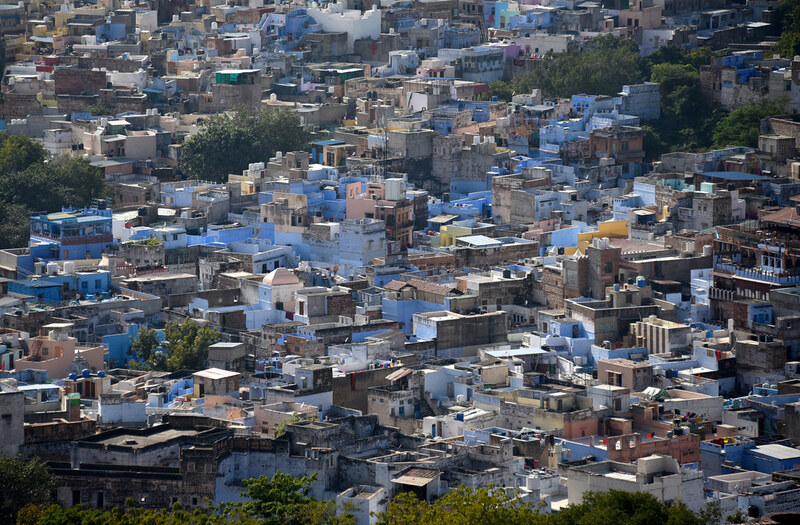 The city of Jodhpur is nestled in the valley and has the strikingly blue color which stands out against the landscape but the color is not just for esthetics. It’s a practical choice. The blue color is derived from limestone and indigo mixed together and painted over the all houses’ walls. The cool blue is perfect for the extreme summer heat and indigo acts as mosquito repellent. Mehrangarh Fort’s construction started in 1459. The fort that stands today was built over a 500 year period! It was built in phases by 29 kings of the same family. The fort still contains sections built in the fifteenth century. 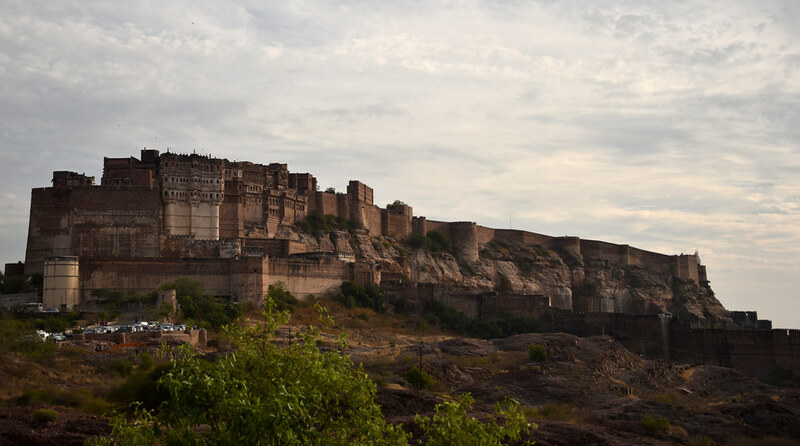 While Jodhpur and the fort remained under the same family over the centuries, there were spurts of hardships, growth, modernization and Mogul influences as documented in Mehrangarh’s architecture website. Sections were added, repaired, remodeled and preserved under the direction of the 29 kings that governed Jodhpur during these centuries. The fort is huge, compared to many forts we’ve visited around the world. It is 550m wide by 350m long and 155m high, perched on top of the mountain overlooking Jodhpur and the kingdom for miles. The fort city’s wall is 10km long. Along the wall, it has 12 gates for citizens to come and go. Near the entrance is the Darbare Aam or the Male sitting area. In the King’s absence, locals were seen by princes in these rooms to resolve disputes and address grievances. As a Rajasthani, myself I’ve heard stories of the righteousness, bravery and high ethical standards of the Rajput kings. In a way, this place was important as this is where princes were trained to become wise kings and ministers. This layout (men’s sitting room at the entrance) is, in fact, popular even in our residential havelis in Jaisalmer, Sardarshahr, Churu. The main chowk (a square courtyard surrounded by rooms) of Mehrangarh fort is called the Sringar chowk. It was and still is the site for important ceremonies and for receiving important visitors. One of the big events in this chowk was the King’s coronation. In 1952, this very same chowk was used for the coronation of the current king, H. H. Maharaja Gaj Singhji and fatherly figure for Jodhpur. This chowk is a great example of the fort’s architectural evolution over the centuries as it was built and re-built by many kings. The coronation tikal has always been performed by the Bagdi family. As the story goes Bagdi family are the descendants of the older brother of Rao Jodha (founder of Jodhpur). The elder brother Akhairaj ji, gave the kingdom to Rao Jodha when Jodha demonstrated his valor in war and won back Marwad. As is customary, only men are allowed in the chowk. But, women are not left out. Women observe all the events from the one way windows or gharokhas in the upper levels, hidden from the men. Ornate Jharokhas for women to watch without being seen are everywhere in the palace. A museum of transportation displays many palanquins and howdahs used for a variety of purposes, for example, there is king’s howdah for traveling, hunting or warfare; or a howdah for 3 people; a queen’s howdah. The elephant howdah (the King’s seat on an elephant) is made on a wooden frame and embossed with silver. It has iron rings to strap onto the elephant. It’s from the 19th century. A queen’s palanquin is covered while the palanquin for the king and his servant is open. This is a queen’s palanquin from the 19th century, but palanquin was used by women as recently as the early 20th century to travel in pardha (covered from view). The safa is long enough to draw water from a well in the desert, using a bucket or simply soaking the fabric. Yellow or white safa are for working in fields to keep the head cool with natural air conditioning from perspiration and breeze. Ceremonial safa have many bright colors. In fact, Rajasthanis have safa for every occasion, season, fashion and just about every reason. Safa also signifies the status and region the man comes from. Mehrangarh fort’s Gallery of Turbans(safa) documents and shares the various kinds of safa and their uses through the ages. Women outfits are even more colorful and embellish the woman from head to toe. Here is a loacl woman dressed in traditional Rajput outfit going about her chores. 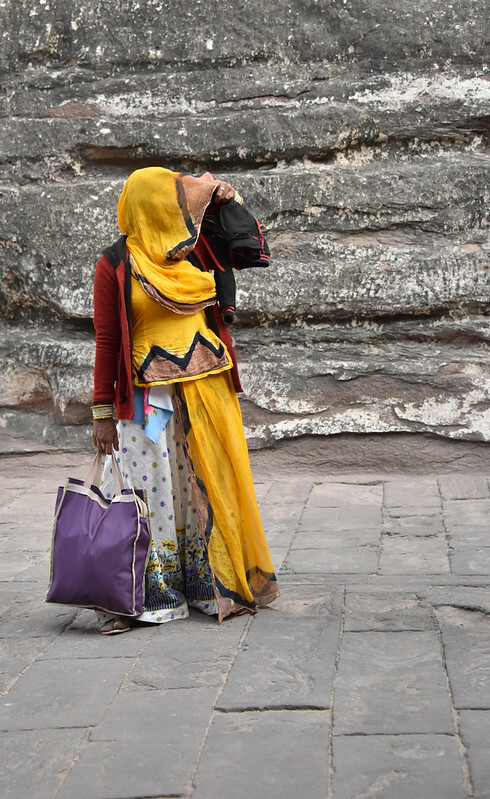 There is so much to be said for the women’s outfits, I should write an entire post on traditional outfits of women of Rajasthan. 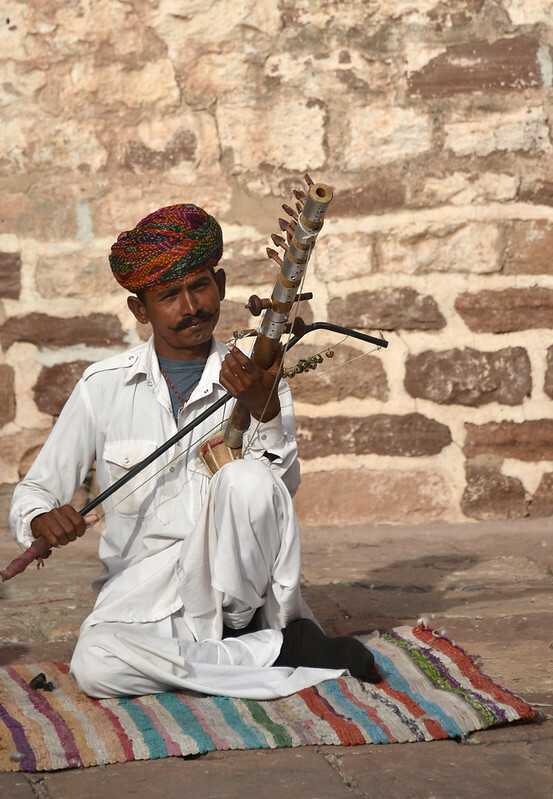 The Rathores (the Royal family of Jodhpur), nurtured a distinctive culture of art, music, architecture and literature. The Art gallery of Mehrangarh fort showcases masterpieces by many artists of Jodhpur. Of the museums I’ve seen in India, this is the most well preserved and presented. The collection of art pieces depicting epic narratives of Jodhpur were developed under Maharaja Vijai Singh(1752-93). The many pieces in the gallery show the lifestyle of the kings, qualities of the ideal king, role of women in society and so much more. 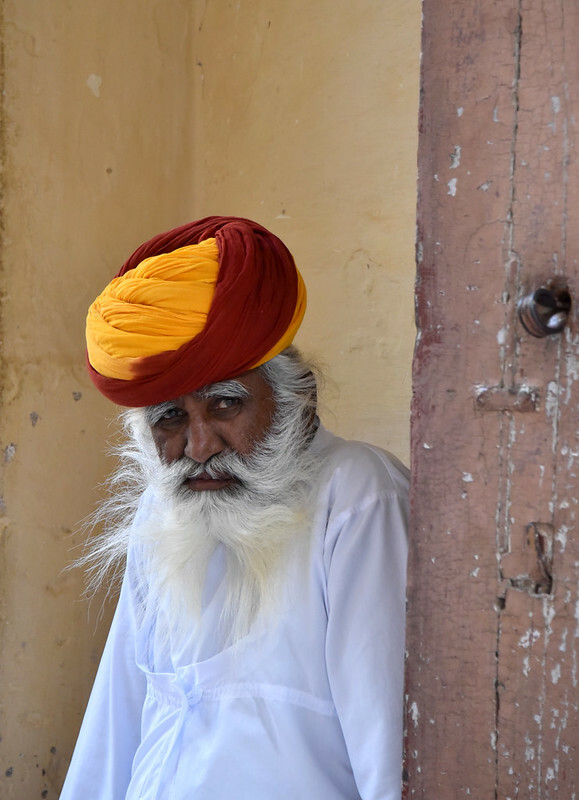 The grand King’s court of Jodhpur reflects diversity in its people, with the many turban styles and skin tones. It was common for women riders to accompany the king on hunting expeditions and do the hunting. The artists of Jodhpur used the ‘Miniature’ style in their art, where the paintings have a great deal of detail. They are painted with fine squirrels tail brushes, sometimes the brush is just one strand of squirrel hair! The colors are made from vegetables and minerals. The paper is a stack of very fine paper layered and glued together to create a thick and rich texture. Distinctive features of a Marwad painting. The Cradles Gallery is one of the unique features of this fort. “It is located in Jhanki Mahal, which translates as the Palace of Glimpses…because from here, women could peep through the stone Jali screens and amuse themselves with the activities in two separate courtyards, one on each side…the Coronation Courtyard and the Courtyard of Treasures. Several beautiful cradles, including an electric powered one made for the present Maharaja, make up a rare and unique collection.” as described in the fort museum website. It has dozens of baby cradles used for royal babies through many centuries. The exhibit shows the transition in artistic styles and continuity of traditions through the generations. The jhakhi mahal was probably one bustling with activity with all the queens, children and many maids. If someone returns from those ages, they would be stunned by the quiet serenity of this place… except for tourists in peak season. The few staged rooms at Mehrangarh fort give us a glimpse of the days when the royal family lived here. 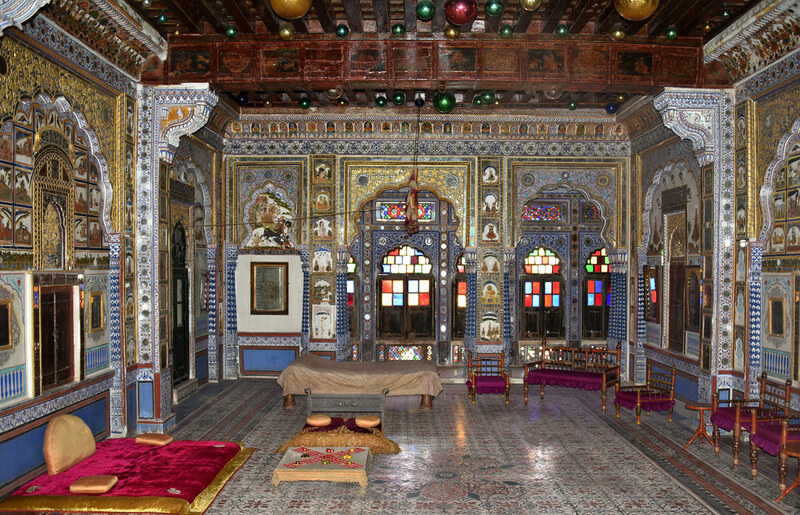 Four of these period rooms are described in Mehrangarh’s website. 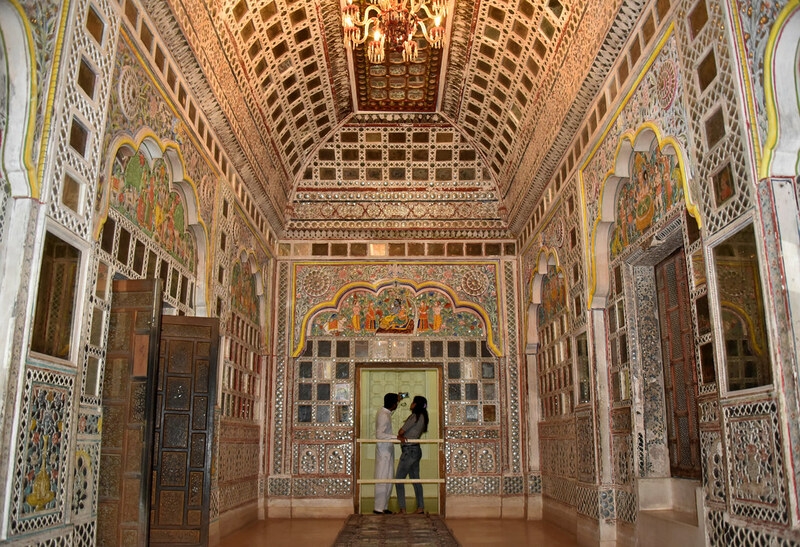 The Sheesh Mahal was Maharaja Ajit Sing’s bedroom. It is decorated with hanging glass balls and miniature paintings of gods and goddesses under the arches. The room is also decorated with glass and mirrors. It has a wooden ceiling to keep the room cool in the summer. Notice the beautiful fresco flooring with intricate designs. Even the bedspread is luxurious red velvet. Many castles in past centuries had grand Halls of Mirrors like the Palace of Versailles, Jaisalmer havelies, Sardarshahr etc. It must have been the fashion statement for the rich to decorate entire rooms with glass and mirrors. Moti mahal is a conference room from the 16th century. It was built by Sawai Raja Sur Singh (1595-1619) as a Hall for a public audience. The king met with court visitors and subjects. Behind the curtains were seating for the five queens, so they could hear and participate in the court. The queens were generally the kings most trusted advisors. The Royals created a code language to pass messages through the curtains, away from the eyes of the visitors. The walls were covered with sea shell and marble dust. It looks gorgeous white and stays that way irrespective of usage. Back in the day, they played holi in this courtyard and yet the walls are pristine like polished with pearls. Zip lining in Mehrangarh is an absolutely amazing experience. We nearly missed it as we took the time to enjoy the fort and listen to the musicians. We literally ran to the zip line office to enter before they close. They were sold out, but the company was extremely accommodating. They arranged for guides and took us on the last trip of the day. The views of the majestic fort on one side, the blue city on another, the lakes below, clear blue skies above, in the backdrop of the rugged mountains – all make for a picture etched in memory forever. To top it off, this was my first zip lining experience so the thrill of flying through the air was out of this world. Zip lining at Mehrangarh fort is run by a Flying Fox, a London based company. The guides were very professional and extremely patient. At the first stop, I was too hesitate, the guide calmed my nerves and convinced me that I was fully in control and that he would not let go until I wanted to take off. After that first stop, it was so much fun that I’d love to go back. Zipping over the lake towards Mehrangarh fort, I wondered if I should close my eyes and feel the fresh evening Marwari breeze OR marvel at the sight of the Blue City OR soak in the views of the rugged mountains OR be in awe of the majestic fort. Luckily we had 6-7 zip lines and hikes between each, so we get a variety of perspectives. 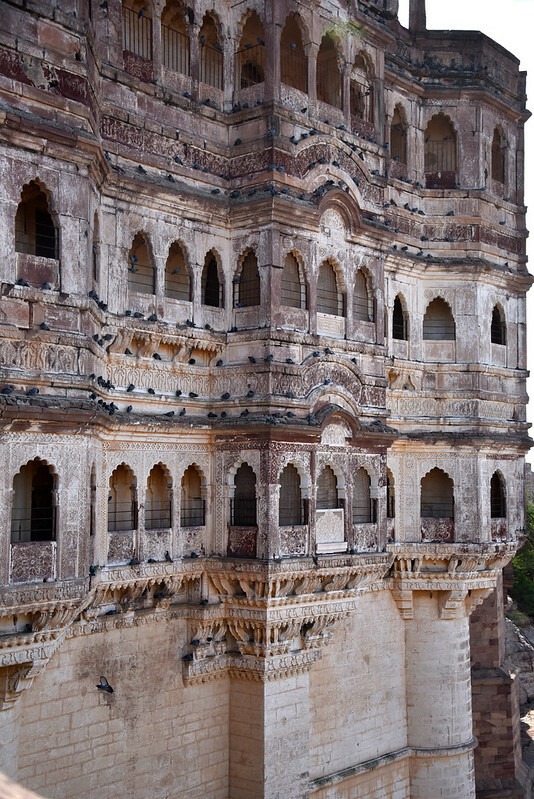 Be absolutely sure to go zip lining in Mehrangarh, unless you physically can not. Get in line early for zip lining. They close before the fort closes and well before sunset. Wear comfortable shoes because there is lots of walking and climbing in the fort. We were there on a lovely December afternoon and we didn’t need a sweater. Like any mountains in the desert, be prepared for weather changes. Any other tie of the year will be very hot, so be sure to carry sunglasses and water. As always, take a good local certified guide to get a combination of history, local stories, and a personal touch. It’s much better than taking pictures without the context. We took a guide arranged by the hotel (Ajit Bhavan Palace). He was with us for two full days. He was very knowledgeable and flexible. He tailored the trip to our large group’s evolving plans and yet got us to everything individuals in our group wanted. Hiking around the fort looks really nice. If you’ve hiked up there, please share your experience below. Zip lining in Mehrangarh Fort in Jodhpur, India is so much fun. Hi Prabhu, a photo shoot in Jodhpur is a wonderful idea. You must have some awesome pictures. And I totally agree on going there in winter. It’s not as crowded as Jaisalmer and the weather is awesome.